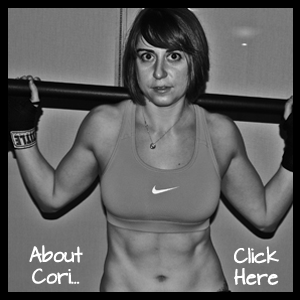 Ladies…Do you want to learn how to do a pull up? So we did testing the other day at the gym and one of the tests was a pull up test. You probably aren’t surprised to hear the following statement, but we only had a couple of women who could do legitimate pull ups (by legitimate I mean no kipping…I have nothing against kipping, but it isn’t a TRUE pull up even if it does have its own benefits). When I then asked all the women that didn’t do a pull up if they would like to be able to do one, most did say YES. Actually all said YES. So then…why weren’t more women able to do one!?! My theory is that most of the time, it isn’t that we don’t want to be able to do something, it is just that we don’t know where to begin so we don’t even start. Or we are intimidated by the move and don’t believe we can do it (again because we don’t know how to get there). Or we jump into something we think might help with no way to track our progress and then we fall off when we aren’t able to do a pull up within a few short workouts. So below are some great tips to help you be able to do a full pull up! Scapular Wall holds – You’ve probably guessed by now that I LOVE these. They are great to improve posture and activate your upper back muscles. If you want to be able to do a proper pull up, you need to make sure that your lats activate and that you use the big muscles in your back. This move will help you do that. Scapular Push ups – This move does the same sort of thing that the wall holds do – It helps you get that scapular retraction that is necessary to do pull ups. Dead hangs – So at the beginning, I want you to just hang from the bar and get a feel for holding your body weight. Focus on tightening your core and even maybe tighten your back as if you are going to pull up. Then once you’ve done a few straight hangs, you will progress to a hang with a scapular retraction. You then want to press your chest out and pulling your shoulder blades down and together while you hang from the bar. If you can’t hold for long at the beginning, start with reps of retracting and then relaxing. All three of these moves make you activate the muscles used to do a pull up and help you warm up your core! Many people who can’t do pull ups will then turn to the lat pulldown machine and even simulate pull ups with bands for their “pull up” workouts. And while these moves are great to strengthen many of the muscles used by pull ups, they still aren’t the same as actually doing pull ups. They can be great supplementary moves, but if you want to be able to do pull ups…You’ve got to actually do variations of the pull up! I haven’t used this machine now in over a year and some and guess what!?! By doing negatives and holds my pull ups have gotten WAY BETTER than they ever were doing lat pulldowns! So once you’ve done the activation moves, try one of these assisted pull up variations and progress toward harder and harder variations until you can do one unassisted! If you have an assisted pull up machine, you can use that as well, but I personally like these better because they give you more control over the exact amount of assistance! With both of the assisted variations below you can do three different things to progress or regress the move. You can do holds, negatives and full range of motion pull ups/chin ups. Holds – You can hold at the top, middle and/or bottom of the move. Each will work on strengthening the muscles at each piece of the motion. You can jump or push yourself into position and then hold once there for as long as possible. Negatives – With negatives, you work the eccentric part of the motion. To perform a negative, you will set yourself at the top of the pull up and then lower yourself down as slowly as possible. Full pull up – You will use assistance to perform a FULL pull up, which means chin above the bar to arms straight at the bottom. 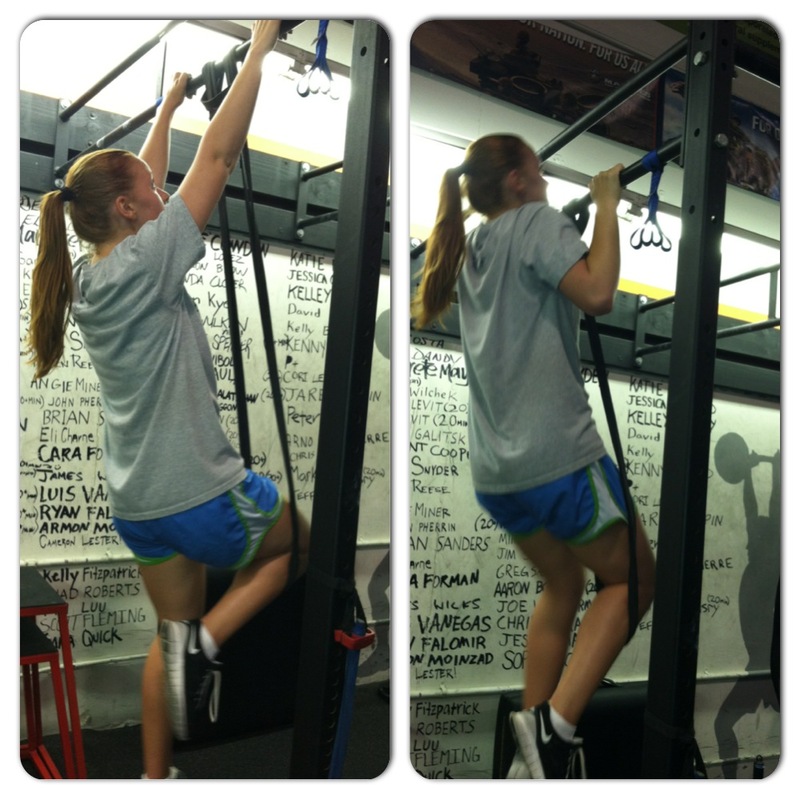 Foot assisted pull up – Hang from a bar or use TRX/Jungle Gym straps. Place your feet on the ground underneath you. The more firmly planted your feet are, the easier the move will be. Your goal is to use your feet as little as possible. Your feet will assist only as much as you so that you can perform a hold, negative or full pull up. Band assisted pull up – Hang from a bar with a band around your knee or knees (putting the band under both knees makes the move easier). The band will add assistance as you perform the move. The skinner the band, the harder the move. The more you control the move and don’t swing, the less the band will propel you up. If you don’t need assistance to hold a pull up or chin up or to perform a slow negative, then you may move to the bar without assistance. Don’t use assistance if you can perform 10 3-5 count negatives (and not a fast count) or 30 second holds without assistance. Make sure you can perform the move correctly before advancing. But also make sure that you are always checking your progress to see if you can perform the moves without assistance. Remember, your goal is to lower assistance as you master each move. 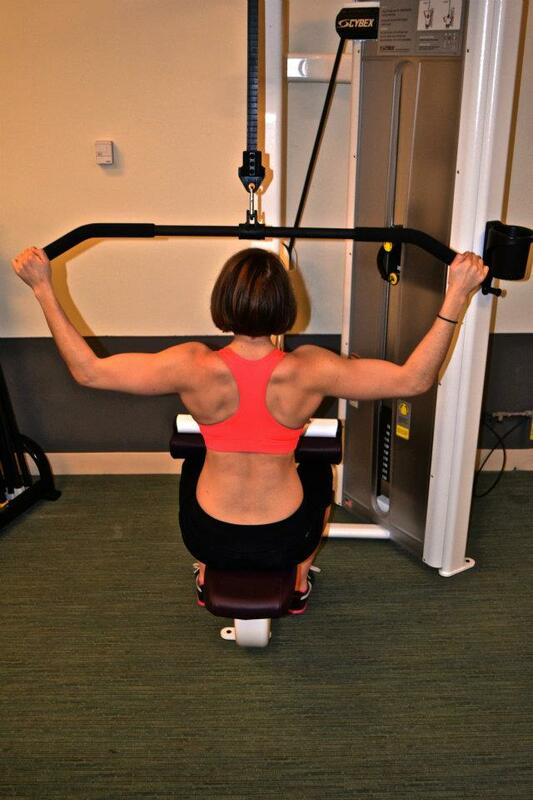 Don’t just waste time on the lat pulldown machine trying to get stronger or by doing assisted pull ups on the machine. 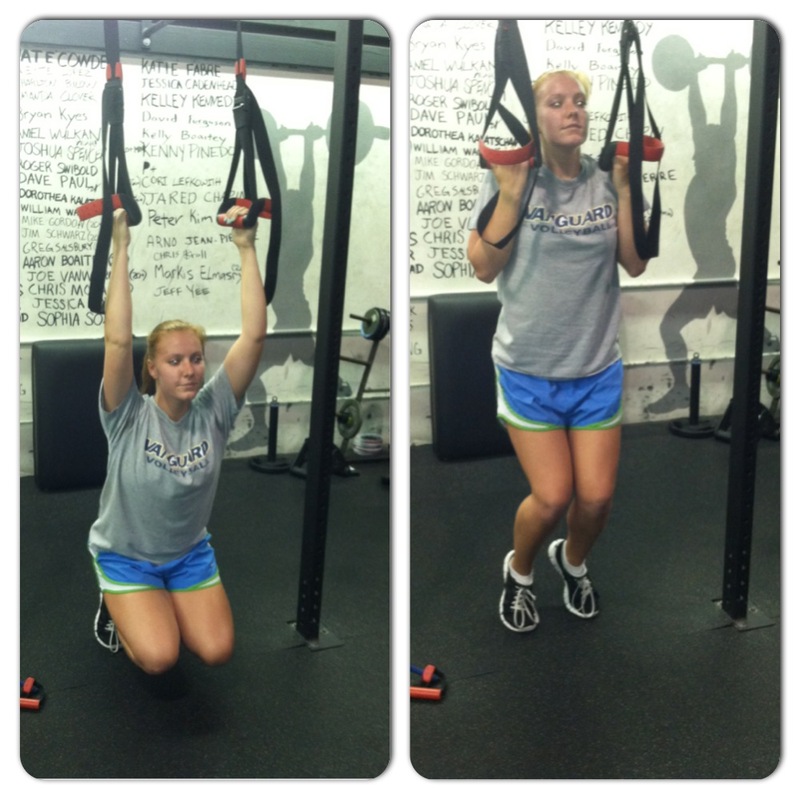 Work on each piece of the pull up and ween yourself off of the assistance! So do you want to be able to do a pull up? What are you doing to get better at them? Here is also a great workout to strengthen your back and biceps to help you get stronger so you can do a pull up. NOTE: In this post I didn’t really go into grip variations. The easiest grips to do are usually the neutral or chin up (palms facing you) grips. The pull up grip and wide grip variations are generally more difficult. Posted on May 27, 2013, in Benefits of doing "man" exercises, program development, Workout and tagged assisted pull ups, back workout, being able to do a pull up, girls doing pull ups, pull up progression, pull up workout, Pull Ups. Bookmark the permalink. 6 Comments. I can do 5 pullups in a row right now. It took a while to get to 1, so I would say be patient! Some of the things that I did: bent over rows, dumb bell rows, body rows from the Smith machine, lat pulldows (2 arms or single arm). It was an amazing feeling to get the first one, so keep trying! Now when I go to the playground with my son, I always try to get a few sets of pullups in from the monkey bars. Awesome Ada! Congrats on the 5 pull ups! I think I fall into your third category of people who start with no way to track progress and then just kind of move on to something different when I don’t see myself getting any closer to doing a pullup. Thanks for the tips!